Feiwel & Friends, 9780312613464, 40pp. Once upon a time, a man named Barack Obama ran for president of the United States and he won! On the night of his victory, he made a very important announcement: When he and his family were settled in their new home in Washington, D.C., his daughters would get . . . A PUPPY! On a farm in Texas, a puppy had been born. One of ten brothers and sisters, this puppy was lively and smart, but he needed a new home. From a Texas farm to the White House, this is the real story of Bo—the First Pup! 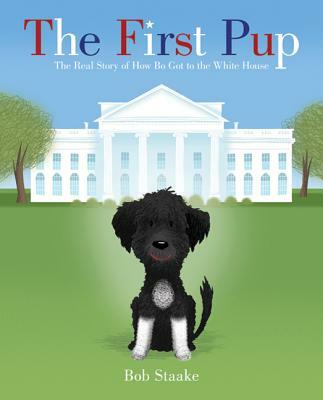 The First Pup is a 2011 Bank Street - Best Children's Book of the Year. BOB STAAKE is a freelance illustrator who has worked on everything from greeting cards to magazine covers, most notably "Reflections," one of the most popular covers in the New Yorker’s history. He has also written and illustrated over 20 children’s books, including This Is Not a Pumpkin and The Red Lemon.